The Greater Columbus Convention Center and Hyatt Regency Columbus were taken over this past weekend by hoards of anime fans to celebrate the thirteenth annual Ohayocon anime convention. For the fourth year in a row, over ten thousand people converged for a weekend of anime, music events, and cosplay. 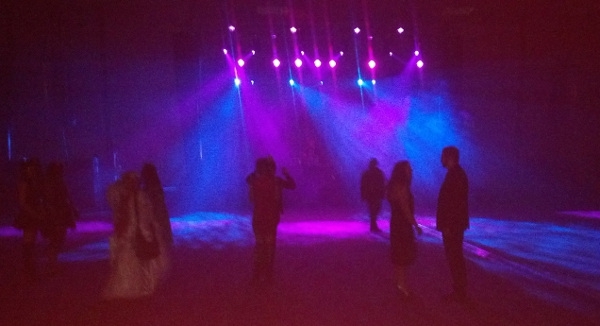 The mainstage room at Ohayocon, just prior to the formal ball. Being a week earlier than in the past few years, Ohayocon this year shared a convention center with auditions for America's Got Talent, but sadly there were no TV crews in sight to be mobbed by anime fans. The Hyatt and convention center could easily hold up to three Ohayocon's at once, giving them excellent space to grow and hold events in rooms that fit the expected crowds - as the rave nearly completely fills one of the massive ballrooms in the Greater Columbus Convention Center. The convention center food court gave easy access to a variety of cheap food all weekend. However, as usual the elevators in the Hyatt came with a long wait on Saturday. Ohayocon's schedule included everything you could expect from a massive convention, with AMV Awards, voice acting panels, mainstage cosplay contests, and tons of fan-run panels. While the Formal Ball was only an hour long, it was filled with excellent music and dozens of great formal outfits. Other major events included a FUNimation industry panel, Who's Line Is It Anime?, and a room filled with Zombie themed events. With headlining guests like Greg Ayres, YTCracker, Chris Ayres, and Spike Spencer, Ohayocon gives fans a chance to meet over a dozen of their favorite voice actors and performers. The guest list at Ohayocon is often very similar each year, which has drawn criticism. At a convention the size of Ohayocon, you'll find crowds of the best costumes anywhere. While there were still thousands of Homestuck characters and random countries from Hetalia, beautifully detailed costumes like Jack Sparrow and Vash the Stampede still impressed. Saturday morning Ohayocon registration is an excellent reminder of the benefits of pre-registration, as the line lasted for about 3 hours. Pre-registered attendees never seemed to wait more than 30 minutes to pickup a badge, and badges were made of a neat solid plastic. Ohayocon had events starting on time and lots of the panel rooms were clearly marked with fancy Ohayocon banners. Ohayocon brings thousands of fans together to celebrate in a weekend of anime and cosplay to meet several awesome guests and participate in one of the biggest dance parties in the country.